Here is another cool NES cartridge mod, this one is definitely one of the coolest we have seen so far, the NES Cartridge Console Mod. The modder Airz has managed to turn this NES cartridge into a handheld NES using an NES emulator and a 2.8 inch TFT LCD screen, check out the video of it in action after the jump. It’s got 4gb built in memory, with a sd card slot in the inside so you could expand the memory if needed, and not only does it play nes games, but it also plays gameboy and gameboy color roms as well. 2.8” TFT LCD, built-in rechargeable lithium battery, Video player, MP3 player, FM radio, Picture viewer, Audio recorder, it’s got a camera and video camera (but I disabled them to fit in the case), built in speaker, and the best part… TV-OUT !!! so you can play on the big screen! The unit has 2 additional buttons on the front, ones power, and the other is used to navigate the main menu, basically it’s a ‘back’ button. And there is a small hole drilled in the back with a reset button behind it. 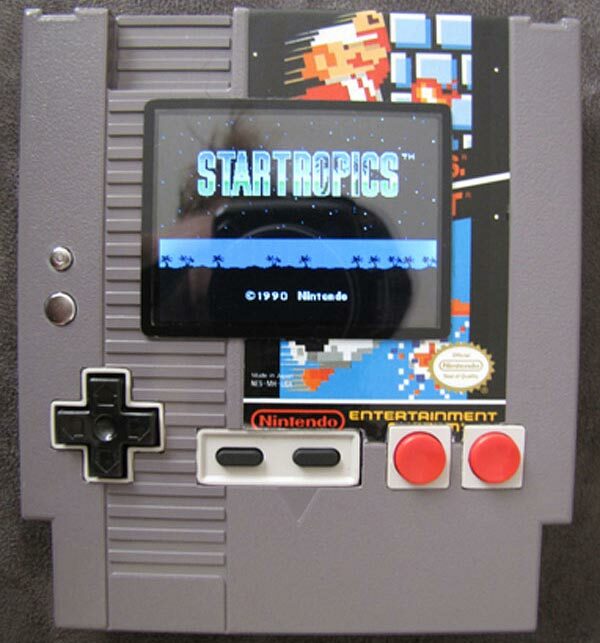 Very cool head on over to Ben Heck forums for more details on this cool NES cartridge mod.